Today is July 31, 2018, and it is the last day of #WorldWatercolorMonth 2018. And even though I’m wearing shorts and the air conditioning is on, I’m starting to think about Christmas. 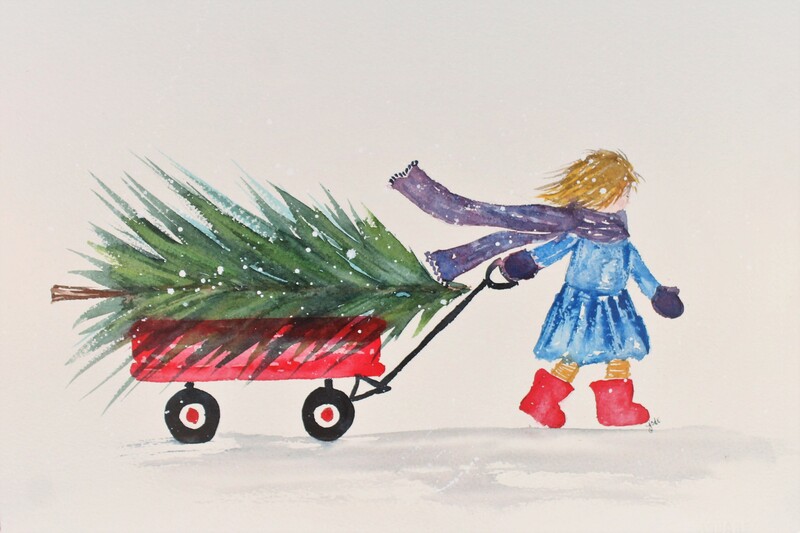 Christmas is such a fun time to create art. 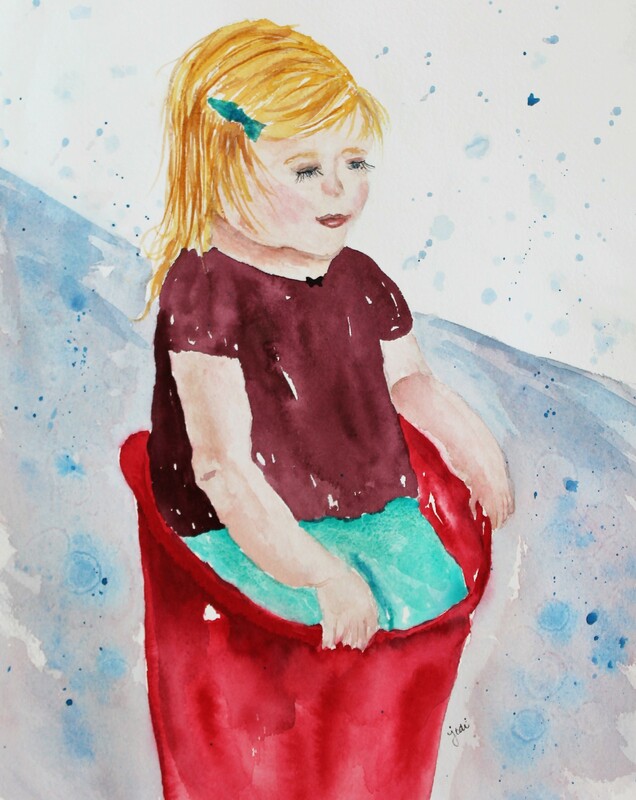 I chose to use my little girl character created for this painting (inspired by my first granddaughter) to feature in this first Christmas watercolor for 2018. 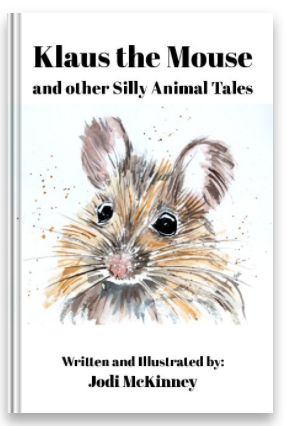 My oldest daughter-in-law and I are starting to think about what we are going to create for fall and the holidays for our McKinneyX2Designs Etsy shop and Berry Vine Gifts and the big Mars Fall Craft Show this year. I’m looking forward to seeing what we come up with and sharing it here. I’m looking forward to another Christmas, but with TWO granddaughters in our family this year!! I’m looking forward to finding time for art. I’m grateful for your visit here today. How much love can a bucket hold? When it’s holding a little girl, who happens to be your granddaughter, it is definitely overflowing! Last weekend, I was “helping” one of my daughters-in-law and her sisters get ready for the upcoming wedding of one of the sisters. As we worked in the barn where the reception will be held on a sweltering hot day, I had the “job” of entertaining my granddaughter so the girls could work. Once we found a couple buckets of water, we were busy for hours, made a huge mess, and had a bucketful of fun! 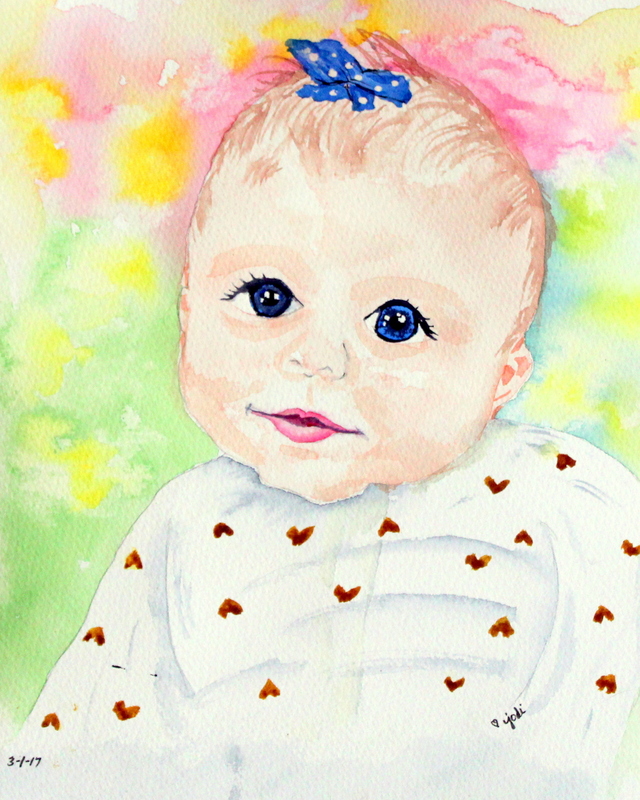 I am not a great portrait painter, and I didn’t do my little cutie justice, but it was fun to try, and since it’s #WorldWatercolorMonth, I thought I’d share. A Blue Pineapple for a Baby Girl Nursery. I had a commissioned request to do a turquoisey-blue pineapple to go with a pink flamingo for a baby girl’s nursery. 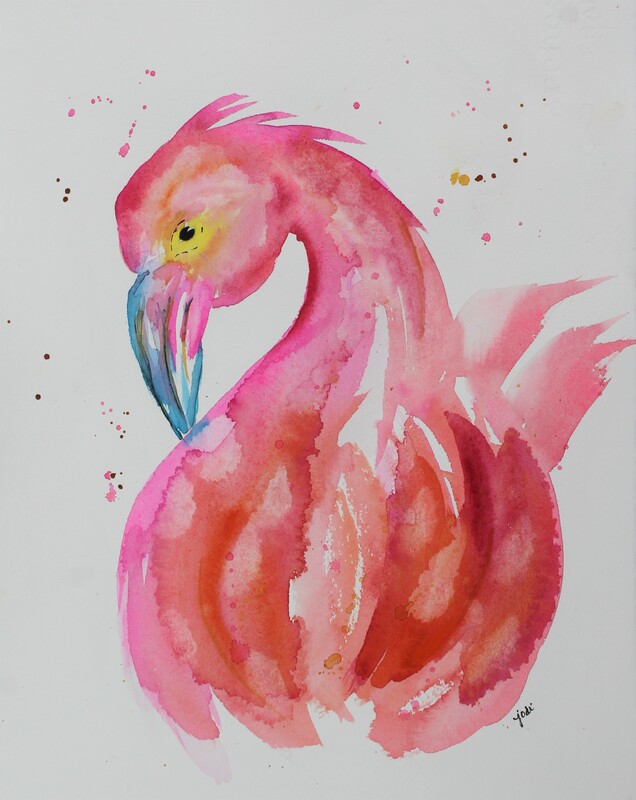 Sweet new mommy-to-be, Sarah, reached out to me through our McKinneyX2Designs Etsy shop and asked if I could do my pineapple in blues and paint her an original pink flamingo – with a couple dabs of gold in each if possible. I have been having so much fun pouring acrylic abstracts lately, it was a mind-shift to gently and neatly “splash” in watercolor, but it came back like riding a bike, and I truly enjoyed creating these original pieces in 11×14 for a sweet baby girl’s nursery. I love the fun, creative ways new parents are decorating nurseries now, and this nursery is sure to be adorable. 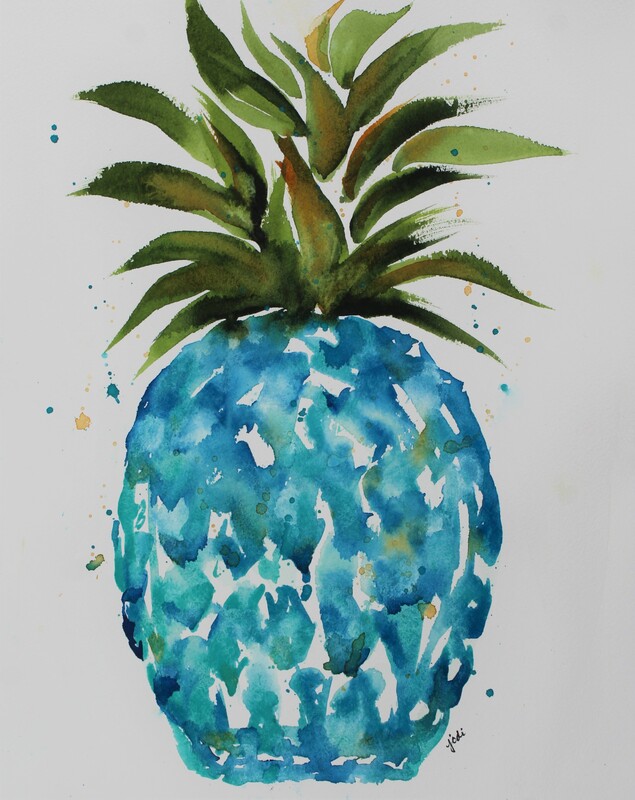 Wishing you a day that is colored with turquoisey-blue pineapples, bright pink flamingoes, and dabs of gold! A Yellow Rose for a Sweet New Baby Girl. A sweet new baby girl was born this week into our extended family. She was named after two of her great grandmothers. One of the great grandmothers loved yellow roses. They were her favorite flower. So in honor of our new little sweetheart, I painted a yellow rose. 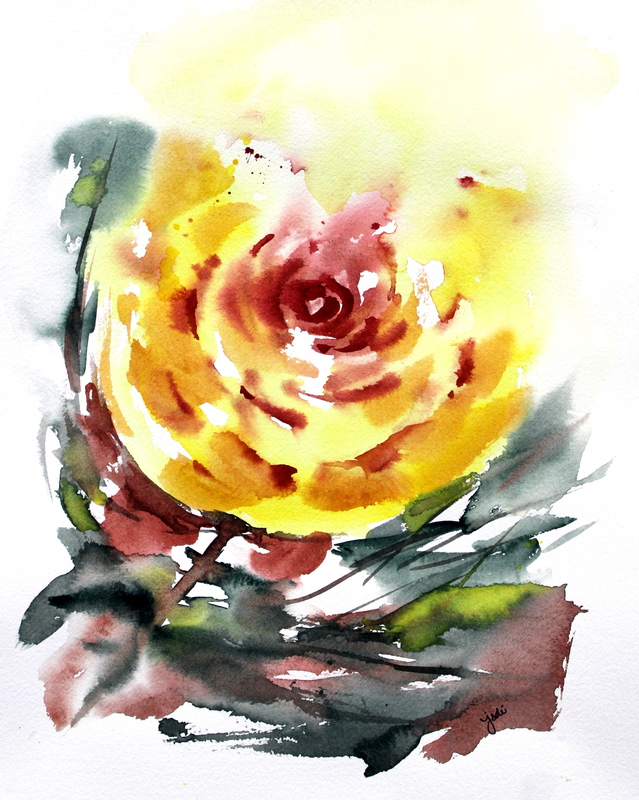 My inspiration for this impressionistic rose is from the amazing style of Jean Haines. Colors used: Daniel Smith Cadmium Yellow, Yellow Ochre, Aliziran Crimson, Burnt Sienna, and Perylene Green. If her Mommy likes it, I will frame it for our new little angel’s room. Amidst all the tragedy and heartache in the world (especially this past week here in the U.S. with Hurricanes Harvey and Irma and the 15-year remembrance of 911), the miracle of birth continues to give us hope in the beauty of life and love. May our little ones create and live in a world of peace. As a little girl, I dreamed of being one myself. I had a little jewelry box with a tiny ballerina that twirled to music when I opened it. 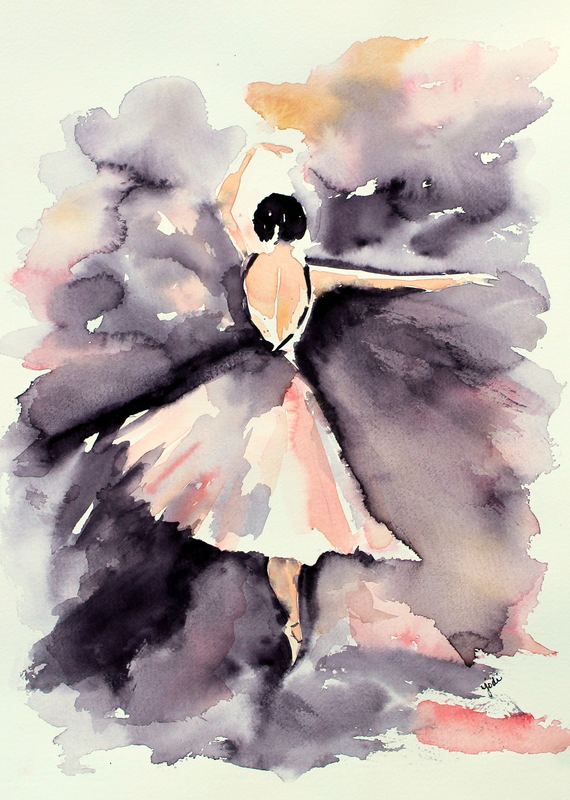 I wanted to be able to do that and look so delicate and graceful and beautiful. But I wasn’t delicate or graceful or beautiful. I was chubby and a bit clumsy and loud. but my mind and body didn’t cooperate with the rest of the dancers. I was heavy-footed and exuberant and impatient. When the rest of the class moved right, I moved left. Just what every teenage girl wants to hear – right?! when all I wanted was long, straight hair. not delicate ballerina feet that could point and hold me up so gracefully. as if I were dancing myself. 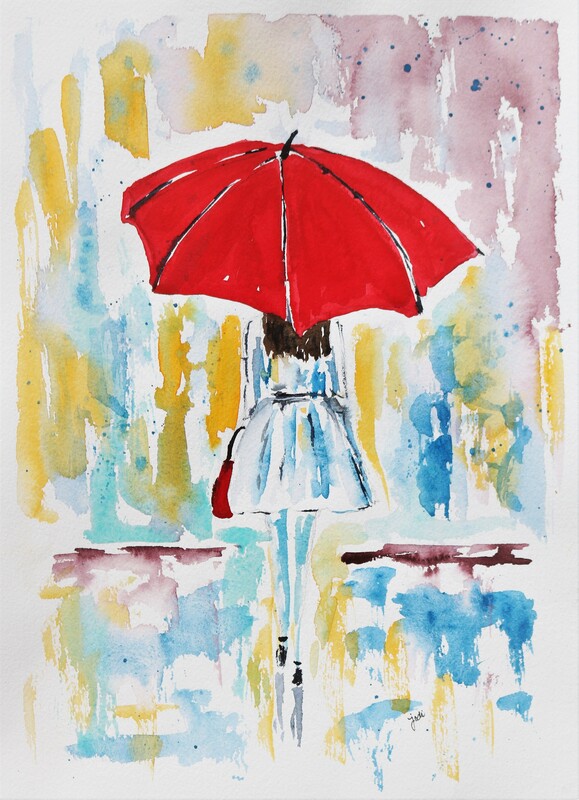 *Painting inspiration from Pinterest (no credit identified). Three colors used: Daniel Smith Neutral Tint, Azo Yellow, Alizarin Crimson. Updating the Nursery at Grandma’s House. 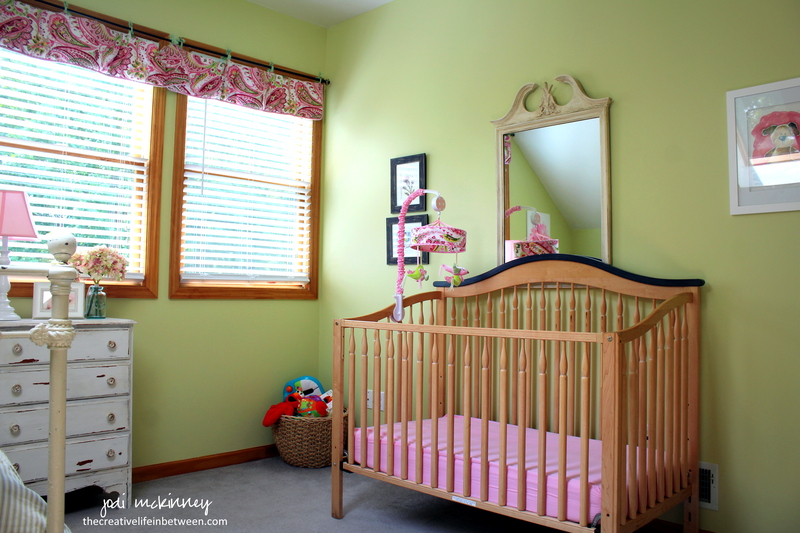 Some of you may remember the fun I had creating a nursery for my first grandchild about seven months ago. 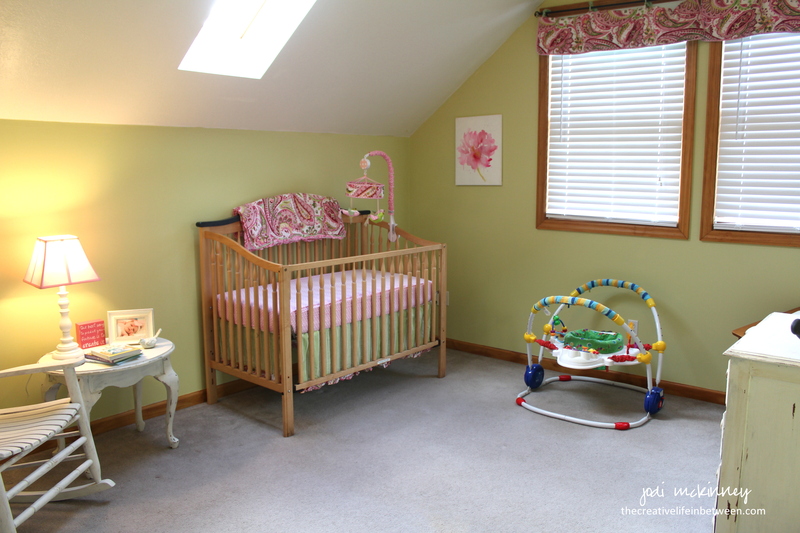 I turned my youngest son’s childhood room into a baby girly nursery room. 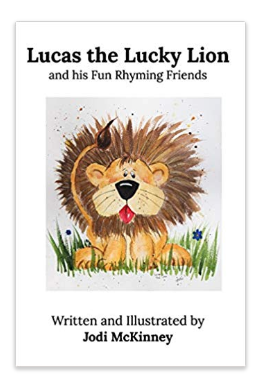 Here is what it looked like when I first created it. 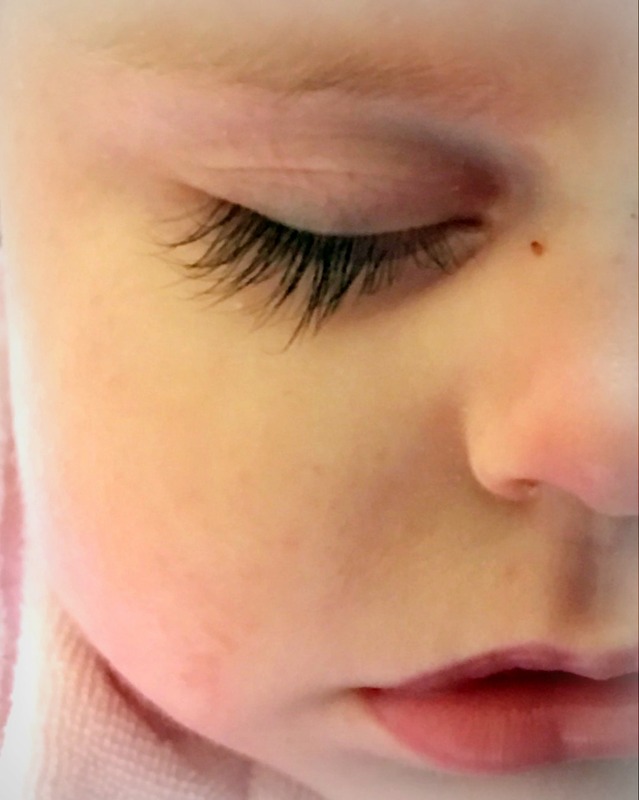 Time is passing way too quickly, and our little girl is growing so fast. She is starting to get around, so it was time to lower the crib so she won’t pull herself up and tumble out. 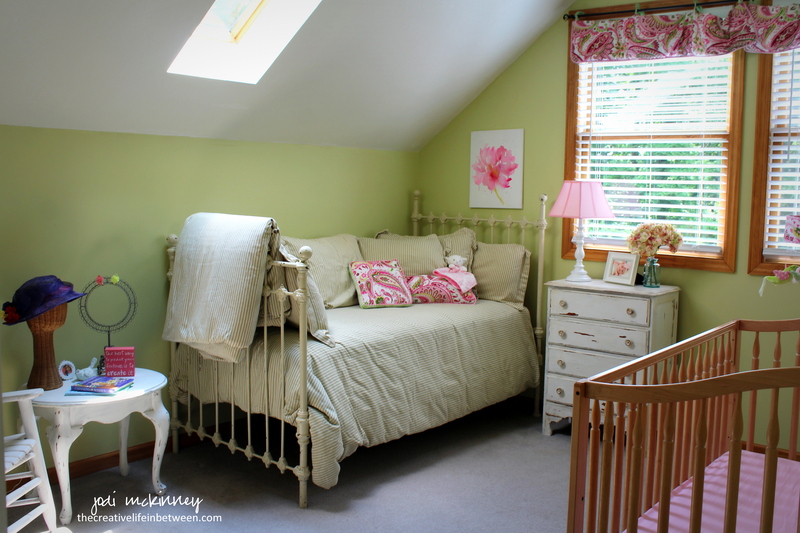 Then, though I hope she doesn’t need it very soon, we were so generously gifted with a beautiful antique iron day bed from my our bestie cousins, Joyce and “Oh Rob,” fully loaded with soft and fluffy Pottery Barn bedding in just the right colors to match our room! Isn’t it awesome?!!?! I moved some things around to make room. It will be a nice spot for us to snuggle up and read books soon I’m sure. 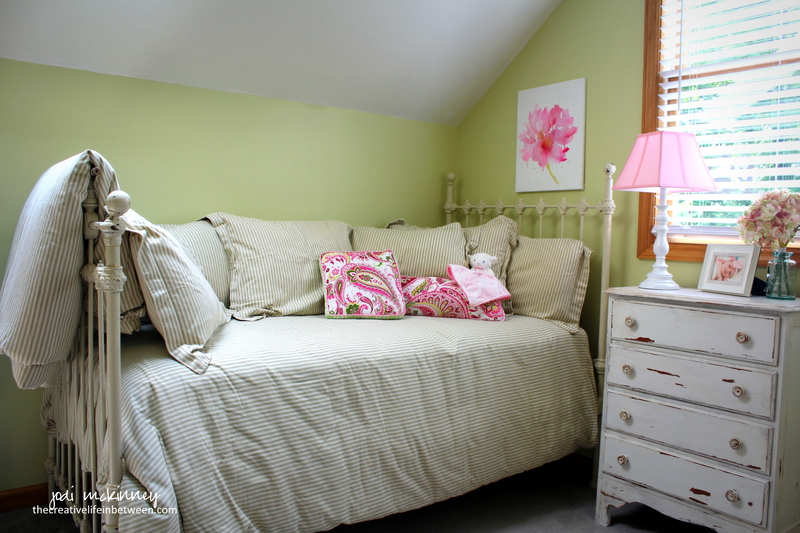 It also adds versatility to this guest room allowing for another “single” to stay over. We love having campers stay over, so the more beds the merrier! Remember how I made the bumper pads into curtain valances (since they are a “no-no!” now)? Well – I still had a piece left, so I cut the ties off, cut about a 6-inch opening on one end, and stuffed it with filling from an old pillow I wasn’t using to create a fun tube-shaped pillow. Throwing that and the other pillow that came with the nursery set really helps carry the theme onto the day bed and pull the room together I think. Aren’t I so crafty clever?!?! Hope you are having fun in all of your favorites spaces with all of your favorite people… at life in between. I had fun a couple evenings this week playing in my new Art Studio painting one of my favorite subjects. Wonder what she will think of these one day? Laugh? Cry? Hopefully there will be more, and they will be sweet memories to her of a grandma that adored her – right from the start. Life goes faster than you think. 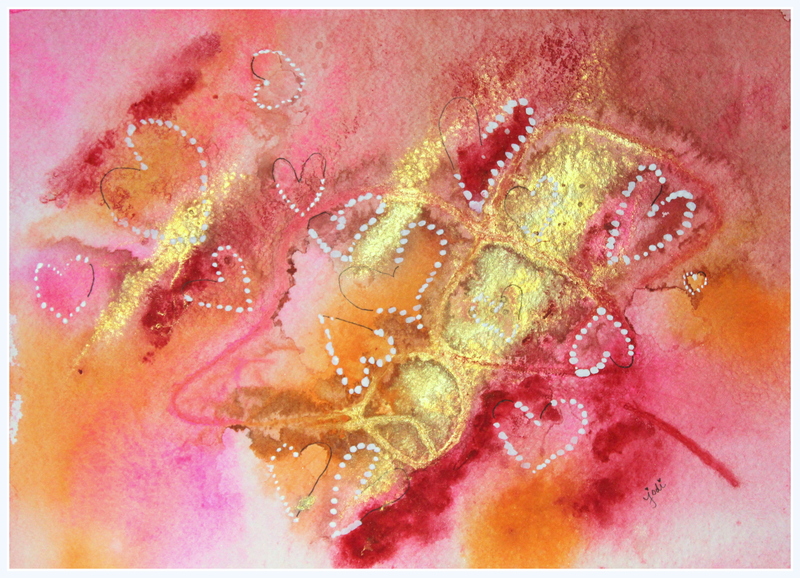 Abstract Watercolor done using: Opera Pink, Quinacridone Rose, Cadmium Orange, Dr. Ph. Martin’s Iridescent Copper Plate Gold, and Dr. Ph. Martin’s Bleedproof White, Salt, Twine, and Black Micron Pen.